Maven CX are a Vancouver, BA based ambient/IDM duo and “Overburnt Afterdrive” is their debut album, a slow-burning forward thinking 13-track record released via Dream Fader. Maven CX traverse from lo-fi sound-collage pieces such as “Escalator Propaganda” which features sprawling layered records and warbling saturated synths to tracks such as the album’s namesake “Overburnt Afterdrive“, which is an abstract electronic track featuring lush synths and textures upon textures. Maven CX effortlessly provide us with an aural journey through wonky soundscapes and mood-setting ambient pieces which are sure to leave a lasting impression. “Overburnt Afterdrive” is available on cassette via the band’s Bandcamp. 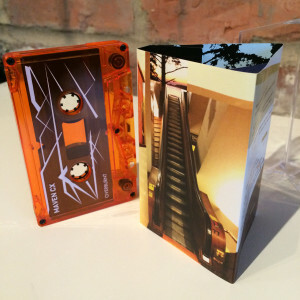 The tape itself is Pro dubbed chrome plus Cassette Tape, complete with a J-plus-2-panel insert including exclusive art, concept, and story.